As a volunteer at the Lotus Children’s’ Centre in Accra, Ghana, I have had the great pleasure to spend the last six weeks working with the Director of the School, Didi A. Shanta, and the lead teacher at the Lotus Nursery School, Angela Boddaa, to incorporate a series of various basic art projects into their school curriculum. The nursery school students here at Lotus Children’s Centre range in age from two and a half years to six years, and we have found that the art projects have given the children not only a great deal of joy but have also provided outlets for expressive play heretofore unimagined and have given many young ones a chance to shine. In my time here working with the children, we have focused on doing some art or drawing work every week. One of the first projects was a very basic one for the Ghanaian Independence Day celebrated here on March 6th. 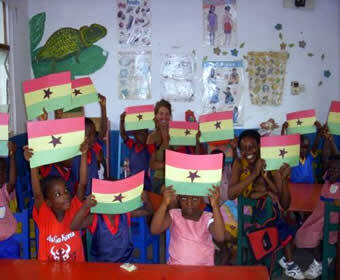 The Ghana flags allowed us to talk about color, spend some time on ordering colors and discuss star shapes. It was a basic project but the children exhibited a great deal of pride in their finished projects as the attached photograph taken on the Friday before Independence Day exhibits. Some of the drawing and art projects have been specifically constructed undertakings – one specific series focused on weather. Though we are not yet in the rainy season in Ghana, we had a surprise storm one night in late February, and the next day we all made umbrellas. More appropriate to the beautiful [and very hot!] weather we have here most all of the time at the present, the children also made big suns and, thinking ahead, rain clouds for the upcoming rainy season, which should begin in earnest in mid-May. Finally, they created rainbows that allowed a focus on color and shape as well. We displayed the entire “weather” series in our library for a week and then allowed children to take them home. We have heard news that there are rainbows decorating bedrooms and the sleep areas of some homes in our neighborhood! In addition to constructed projects, we have given the children some time every week for “freehand” drawing, not something that is generally part of the home educational experience of many of young African children we teach here at Lotus. We have been delighted and surprised with the results, finding some hidden talents in quiet children and, of course [as you can well expect with a group of young boys in a class of children this age!] have seen many pictures of trucks and motorbikes! Letting the children have time to explain to you what they have drawn has been a valuable vocabulary exercise for young students who are just beginning to learn formal English. We have also done a very basic music project – again, attempting to focus on things that the children here in Ghana know well. Drumming is a significant part of the musical scene and an important tradition here in the music community of Ghana, and so we have begun some ensemble work with a simple African drum, some shakers, a tambourine and a snare drum. The children sing and play with great energy and enthusiasm and we are planning a small musical presentation for the last day of our school term. Finally, we have worked with the children to do some very simple dramatic play, again not something that is generally part of their preschool experience either at home or in many schools here in Ghana. 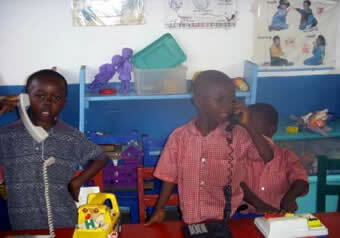 In the attached photograph, the children are calling each other on telephones to discuss some “banking” and then “travelling” to town to deposit some peswahs, our local currency here, in our “bank.” We have found that the young children respond wonderfully to these pretend play exercises, and that these exercises have been helpful in expanding English vocabulary and also basic counting skills. As children go to public or private schools here in Ghana after the age of six, much of their curriculum is focused on letters, numbers, basic math and writing, all of which is presented in a traditional and focused setting. And while preparation for these activities in a structured setting is part of what we do every day, all of us here at the Lotus Children’s Centre have found that the addition of very basic arts concepts into that curriculum has enhanced days of learning.